Stuck. Screenshot What I am missing? Thanks. Have a look at where 7 could go in the sixth row down (not the fifth as I originally typed). This should help to eliminate 7s elsewhere. 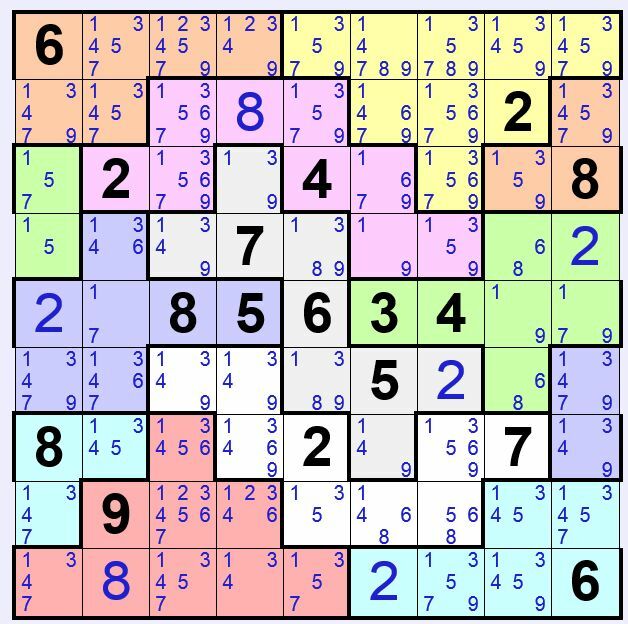 7 is going to R5C2 and R5C9, but in C2 and C9 it is also going to many elsewhere so I can't pair anything to remove possibility in other locations. Yes, seems there is a pair of three, I will try it out and report. Thanks. so cryptic. Even after your hint, it took me another hour to totally crack it. Good one. The number 7 of the sixth row is only in the blue boxes.Therefore the number 7 cannot be in the blue box of the fifth row. Only remains the number 1. Sorry, my hint was wrong! I meant the sixth row down, not the fifth. I've edited my original comment. @carlotes, yes, that is it. I had missed this logic that is much simpler. Thanks. Then, the pair of 3 of 7 that I seemed to have identified was also wrong, but it somehow led to correct filling of entire board. After lots of mistakes and restarts, I finally solved it.